This is SLIG week for The Legal Genealogist — the 2018 Salt Lake Institute of Genealogy is now starting its fourth day at the Salt Lake Hilton, and everyone is having a ball. More than 380 students in a dozen classes learning about everything from law to DNA to research in different locations like the Great Lakes Region or Portugal to methodology and genealogical writing. How much better does it get than that? Yesterday, in my course, Corpus Juris: Advanced Legal Concepts for Genealogists, the students had a field day on a field trip to the University of Utah law library — and I hope most came away with confidence that they could use the law library records in the future. And this all makes for very little time for writing. So this week is at best going to be hit and miss with the word-of-the-day, and today’s word is a little different. It’s nominate. 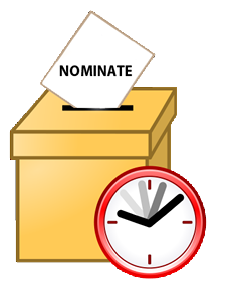 As in: your genealogical or historical society can nominate a candidate for the National Genealogical Society’s Hall of Fame award — but it has to act now. Because the deadline is January 31. The National Genealogy Hall of Fame is an educational project sponsored by the National Genealogical Society. The entire genealogical community is invited to participate in this project. By focusing on the history of genealogy in the United States and on those elected to the Hall of Fame, there will be an increased awareness and appreciation of the high standards those persons advocated and achieved. 1. The nominee must have been actively engaged in the field of genealogy in the United States for at least ten years. 2. The nominee must have been deceased for at least five years at the time of nomination. And nominations have to come from genealogy societies or similar organization on the official nomination form, and mailed by the deadline — January 31 — to the National Genealogy Hall of Fame, 6400 Arlington Blvd, Suite 810, Falls Church, VA 22042-2318, or mailed electronically to [email protected] (And, of course, electronic submissions are encouraged.) Nominations can be supported by letters from other societies. The rules specify that all nominations have to have email contact information, include a photograph of the nominee that can be enlarged and framed for display in the Hall of Fame, and must be signed by an officer of the nominating society. So this is a real opportunity for each of our genealogical societies to honor a genealogist whose efforts or legacy projects have helped us today. Perhaps there was a notable genealogist in our state or county whose name should be memorialized in the National Genealogy Hall of Fame, to take his or her place alongside those honored in prior years, starting with Donald Lines Jacobus in 1986 and continuing through Peter Stebbins Craig in 2017. But — once again — nominations must be in by January 31.